Given the many challenges facing them, why do you think farmers continue to farm the way they do? What do some of the farmers you know tell you excites them most about their work? These questions invite us to think about what motivates farmers and ranchers, despite incredible risks and difficulties. 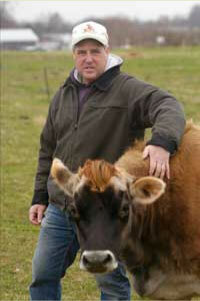 Click on the image to read how Jim Mitchell developed and strengthened his dairy farm business in the midst of intense suburban development.